The serviced apartment industry has risen in popularity and this new trend versus a Hotel stay has, in part been driven by many businesses and corporates discovering the benefits that this type of accommodation offers. Two features in particular have driven the confidence in booking into a serviced apartment, namely more living space and competitive rates – paying per apartment rather than per person sharing and rates are all inclusive. Another contributor to a growing trend in the industry is due to the increase in the number of available serviced apartments, which according to the 2015/16 Global Serviced Apartments Industry Report (GSAIR) has grown by over 80% since 2008. The ASAP, Association of Serviced Apartment Providers in the UK was formed to promote the serviced apartment industry and to create a clear understanding of this type of accommodation. The association was also formed to ensure that operators provided accommodation of an acceptable standard and that their offerings are appropriately communicated to the business, corporate and leisure travel industries. Business and leisure travellers want to be confident that a serviced apartment stay has been assessed by an independent association and that there is a control system in place to ensure appropriate levels of service are offered and accommodation is received in an expected state of cleanliness and is as advertised. Business travel and relocation assignments are reportedly also on the rise resulting in the growing need for suitable accommodation in all the right locations. With more living space and the availability of a kitchen to self-cater, serviced apartments are proving to be a viable alternative to a long-term stay in a traditional hotel. A further trend in the market is that business travel budgets have remained stagnant despite the increase in business travel which means corporates have to be much wiser when booking travel and accommodation. Serviced apartments offer a place the business traveller can eat, sleep, work and relax – all of which provide the chance to cut back on travel expenses plus a serviced apartment is unique in that VAT is greatly reduced to just 4% after 29 days. 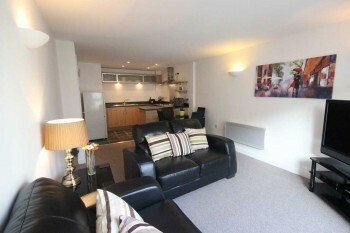 Open-plan living area in a typical serviced apartment. What to expect in a serviced apartment experience? Space – with more than one room i.e. living area and kitchen separate from the bedroom or bedrooms means a spacious accommodation offering a more homely environment for guests and perhaps also their families to feel happy and relaxed in. Serviced apartments range in size from one to three bedroom and even studio apartments for those who don’t need a lot of space but like the idea of a kitchen in which they can prepare meals as needed. Some apartments even extend outdoors onto a balcony or patio area for added space – for smokers this is a great option to look out for if you prefer not to smoke indoors. Convenient location – with a wide choice in many big towns and cities there is bound to be one that offers the perfect location close to travel and central to business hubs. Cost savings – pay per apartment and not per person sharing. Rates are all inclusive of a secure parking bay, unlimited broadband, SKY movie and sports channels. According to James Foice of the ASAP, it is the guests experience that will ultimately differentiate short to long-term stay accommodation from hotels. For this to happen, the real needs of the customer must be addressed. Cotels Serviced Apartment provider in Milton Keynes, Northampton and Luton are fully aware of the huge importance placed on customer service to ensure the best possible experience during their stay. It is for this reason that we go to great lengths to meet their needs during their serviced apartment stay. Cooking essentials – if rice is an essential part of your daily diet, then let us know ahead of your stay (or on arrival) and we will provide you with a rice cooker. Transport via bicycle – bringing your bicycle with you or hiring one for the duration of your trip? We can provide you with a secure bicycle lock-up so that you don’t have to store it in your apartment. Meet and Greet service – to ensure customer confidence we offer a personal ‘Meet and Greet’ service at our Northampton and Luton apartments. As our head office is in close proximity to all our Milton Keynes serviced apartments, guests are asked to meet at our reception desk where they are handed the keys and an easy to follow map to guide them to their parking bay and the apartment they have booked into. Cotels offers short to extended stay accommodation in central Milton Keynes, Northampton and Luton, which are locations where people need to work. Those either looking to relocate because of work, or working in either of the three locations for a fixed period of time might be reluctant to enter the property market straight away. Cotels serviced apartments provides a secure, sustainable stop gap. Our website is filled with images and video of our apartments to help guide you in your decision process when looking for short to long-term accommodation.